Eben Moglen is a professor of law at Columbia Law School, Founding Director of the Software Freedom Law Center, and the leader of the FreedomBox Project. This is his keynote address to the F2C: Freedom to Connect conference. The slides in pdf format. A 3D printer is, at heart, a prototyping machine. They will never be able to compete on volume alone. What they can compete on is high-volume customization. 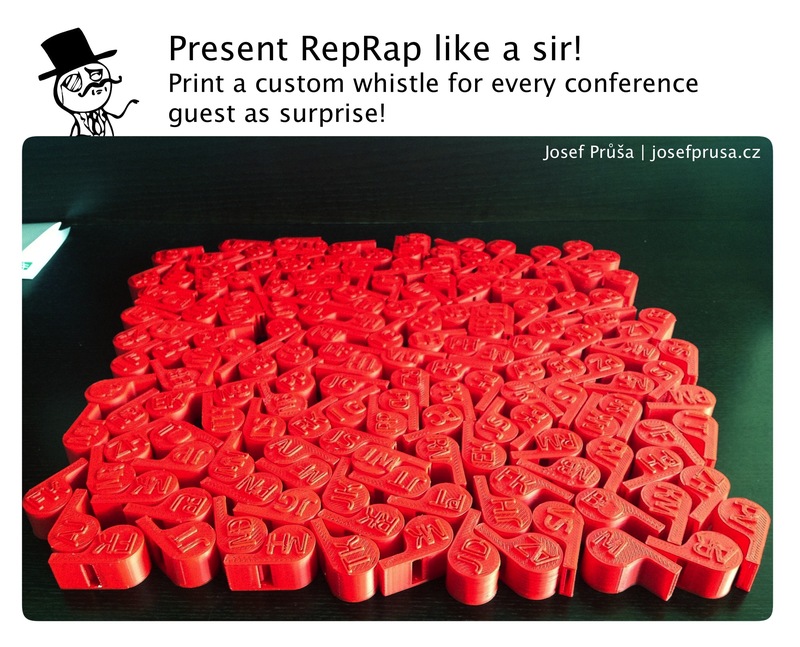 Josef Prusa, the designer of the Prusa Mendel, wrote a Python script to automatically add a custom pair of initials to the many whistles he prints out as gifts. If you look closely, you can tell that each whistle has a different pair of letters embossed on the top. The great thing about open source is that people do cool stuff like this and then give it away! You an download the WhistleGen program Josef Prusa wrote from his GitHub repository. Perhaps someone could modify it to take advantage of two-color or multi-color extruders. Do we really need more gatherings for people to talk about innovation? Yes. Yes we do. Make Magazine is hosting a bunch of people to talk about, “shaping the future of manufacturing and the global economy.” Sounds good to me. A bit of hyperbole never hurt anyone. Personally I think it would be more accurate to put “business” or “profit” somewhere in the name of the convention. As you can tell from the lineup of presenters, this is primarily a for-profit networking event. What I wanna know is who let that guy in? Apparently, “Greg Borenstein is an artist and researcher in New York.” He seems a bit out of place in a list of CEOs, partners and founders. Oh, wait, “He recently finished writing a book for O’Reilly about the Microsoft Kinect, titled: Making Things See: 3D vision with Kinect, Processing, Arduino, and MakerBot.” O’Reilly Media publishes Make Magazine, and is hosting the event. I wonder if he’s going to wear a shirt without a collar just to mess with everyone else.